At Shedd Aquarium, we work with a variety of audiences, including teachers and volunteers, and understand that with today’s busy schedules it is often difficult to find time to learn and build networks. Location, time and capacity are barriers learners face when attending in-person workshops and trainings. 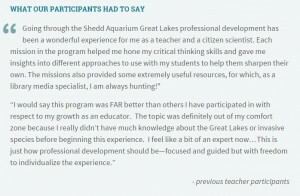 To help alleviate these barriers, Shedd began incorporating new strategies that infuse online and digital badges for learners. As learners build skills and complete activities called “missions,” they are awarded “digital badges,” virtual recognition for the accomplishment of the task. Badging helps to scaffold learning and provide “game-like” motivation. This online concept can be accessed anytime and anywhere, providing shareable credentials. Shedd Aquarium currently has three badge programs for teachers that help build comfort in teaching science topics. 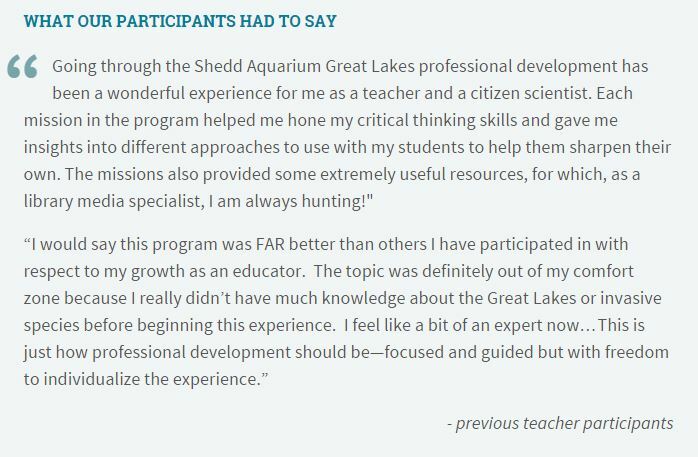 These programs are “Great Lakes Science,” “Amphibian Educator Badging” and “Early Science Learning.” Missions can be completed at a teachers convenience and submitted for completion. Missions offer a variety of ways to connect with content and can include observing, photography, games, forums and reflection. Each submission is reviewed by Shedd staff and given customized feedback, maintaining the important relationship with our learners. 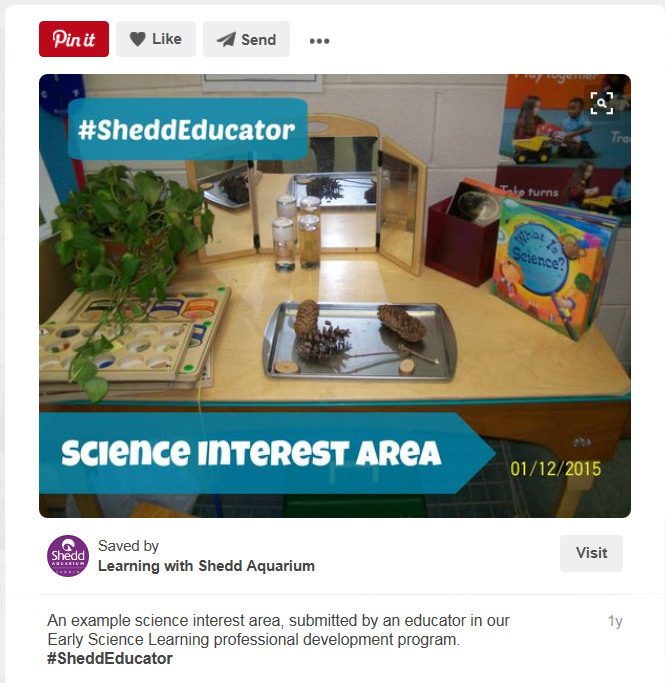 Samples of participant work can be found by searching #SheddEducator on Shedd Learning’s Pinterest boards. These programs helped to spark the addition of an innovative training for our Guest Engagement volunteers, who engage with guests and bring unique backgrounds and skills to Shedd. The creation of an online community utilizing digital badges allows us to better customize their experience. They are able to direct their own training and gain knowledge and skills at their own pace. Peer learning is an important aspect of the community; volunteers learn from and connect with each other. Volunteers also have immediate access to resources to enhance their interactions with guests. The concept of using badging with adult learners has offered a more accessible, timely and motivating learning environment. As we evaluate this new strategy, we continue to shape these programs and create replicable structures for the future.